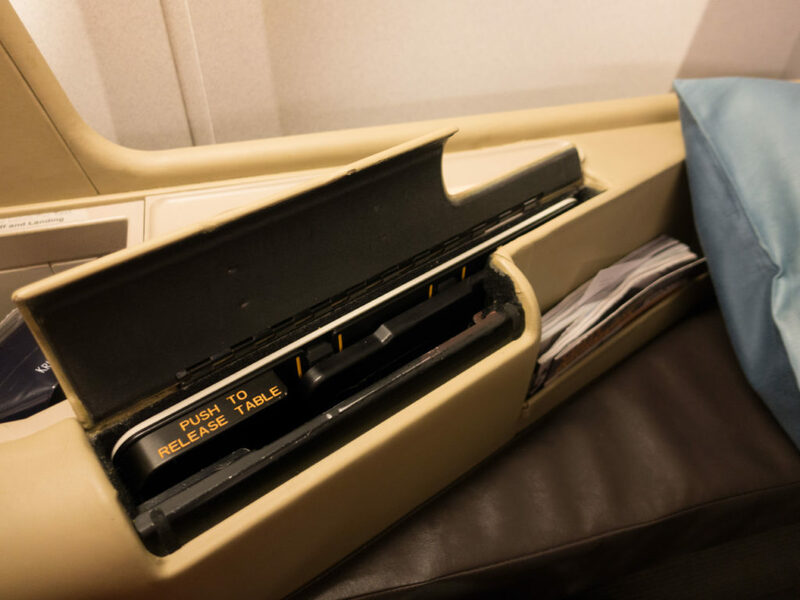 The Singapore Airlines 2006 Business Class seats certainly weren't showing their age on this ancient Boeing 777-200ER aircraft. Still a great way to fly. Having left the EVA Air lounge, I made my way over to the SilverKris Lounge located just opposite Gate D7 of Bangkok’s Suvarnabhumi airport for a quick bite before my flight. 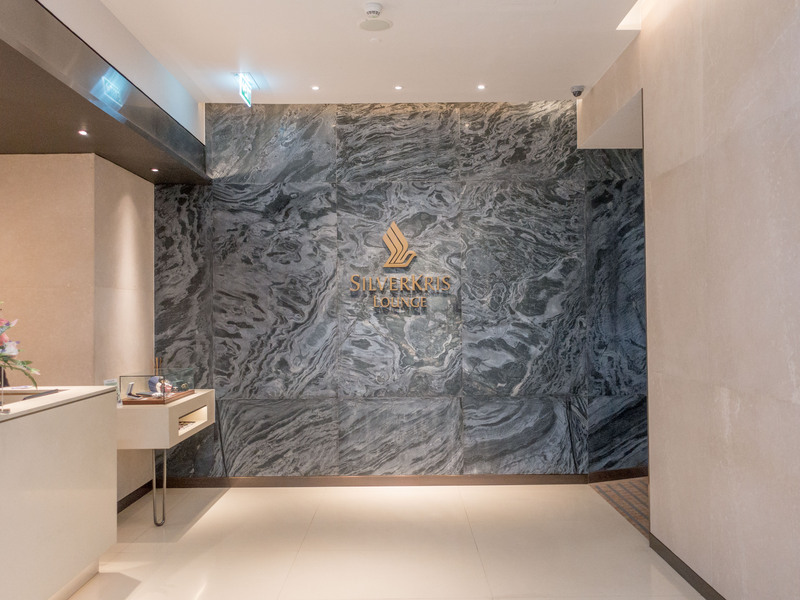 If you’re accessing the transit hall directly from the public area via the priority immigration lane located just after Singapore Airlines check in desks, the Singapore Airlines SilverKris lounge is conveniently located just a few steps away down the escalator behind the golden dragon. 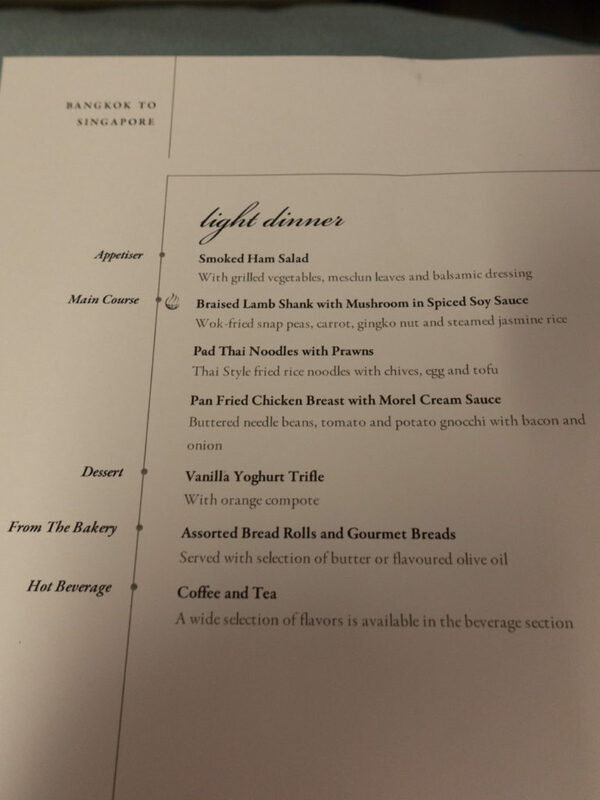 At around 8.30pm, boarding calls were made in the lounge for the last flight of the day on Singapore Airlines back to Singapore. As Gate D7 was literally a few steps away, I hastily made my way into the aircraft hoping to be one of the first onboard. 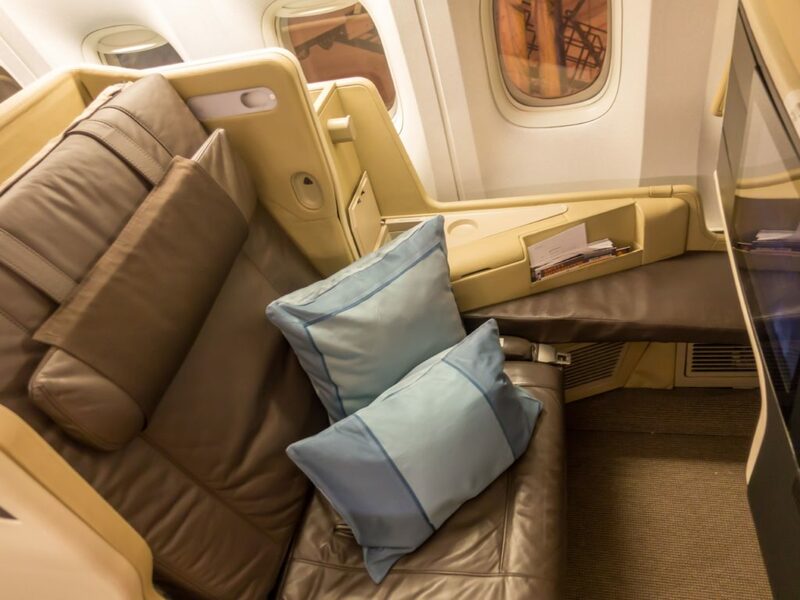 The aircraft that was operating this route that day was a retrofitted Boeing 777-200ER featuring the 2006 Business Class seats in a 1-2-1 configuration. 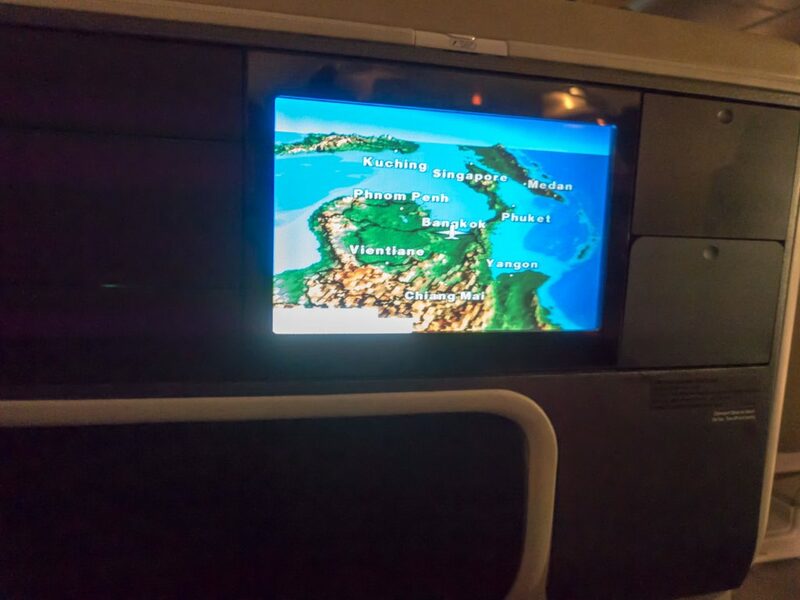 It sure is nice having a fully flat bed on this short hop back to Singapore. 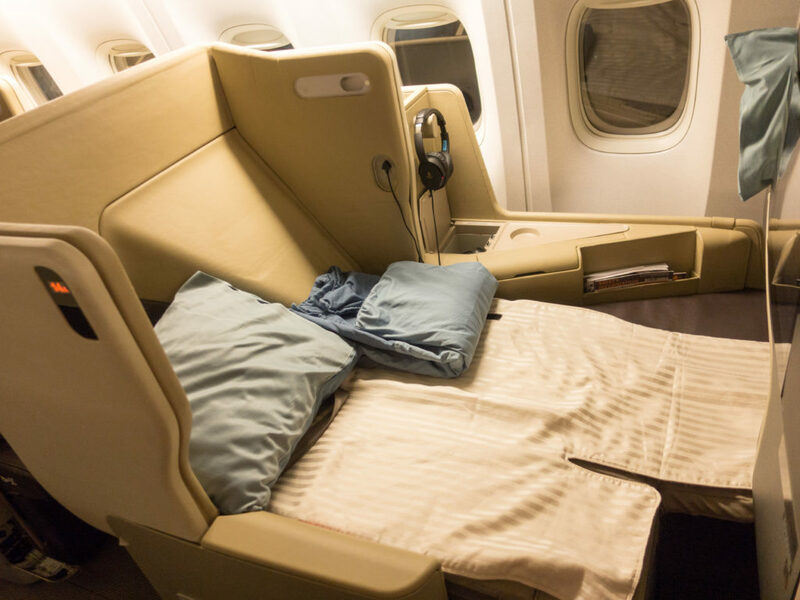 In the coming years, full flat beds will be the Singapore Airlines standard fleet wide with the introduction of the Boeing 787-10 and the regional configured A350-900 aircraft. 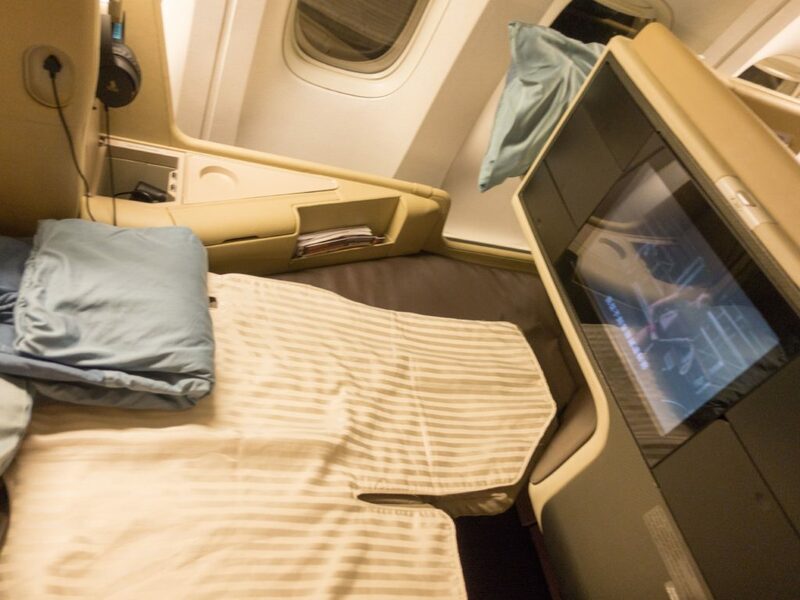 Majority of Singapore Airlines Bangkok flights are operated with an Airbus A330 aircraft with the old regional Business Class product laid out in a 2-2-2 configuration and while I haven’t tried it personally, it sure can’t beat of having a full flat bed for a short power nap onboard. Boarding was already underway for Business Class passengers and passengers with PPS Club status and above as well as KrisFlyer Elite Gold/Star Alliance Gold members. 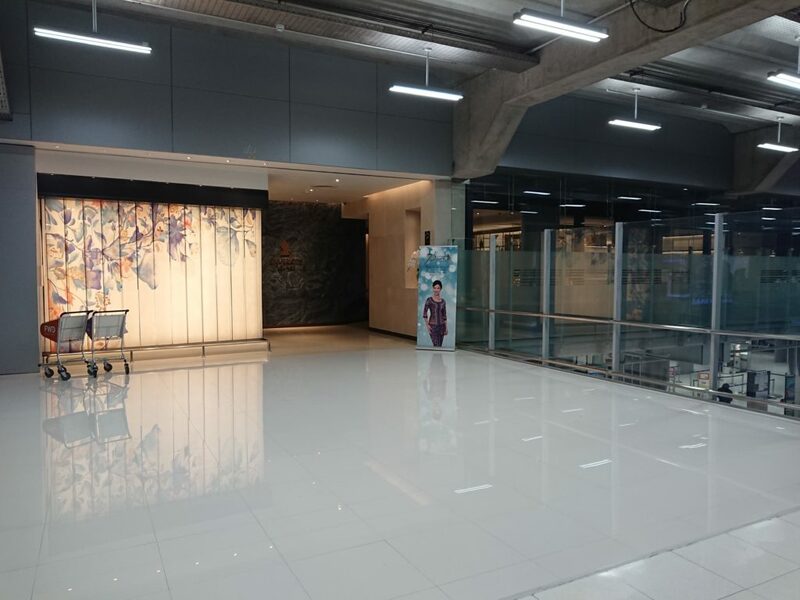 In Bangkok, two separate jet bridges are used for Business Class passengers and Economy Class passengers, so the Business Class cabin was quite calm during the entire boarding process. As I boarded the aircraft via door L1, one of the cabin crew welcomed me on board and pointed me to my seat. 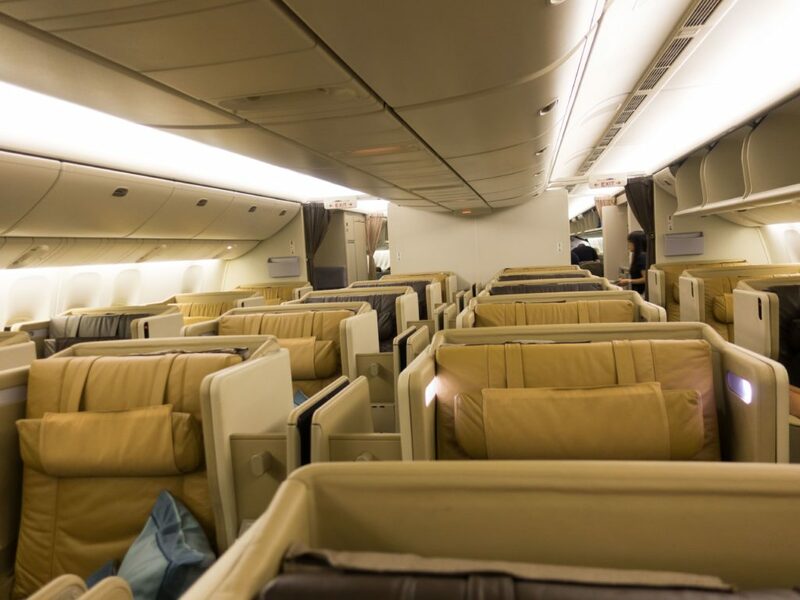 This was my first time seeing and experiencing these massive seats which still holds the record for the widest seat in Business Class. Waiting for me at the seat were two fluffy pillows which I made use of during the flight. 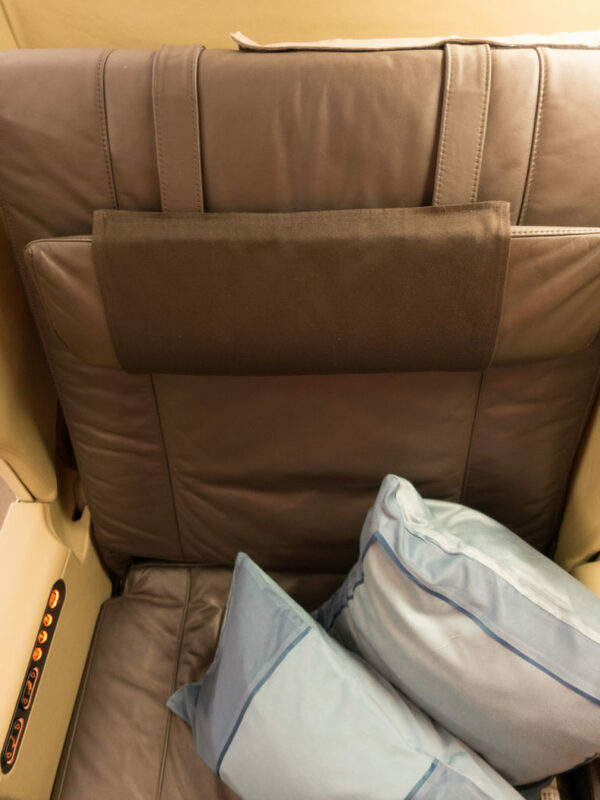 The blanket and duvet was located behind the seat and was already set up should you wish to convert your seat into a fully flat bed. 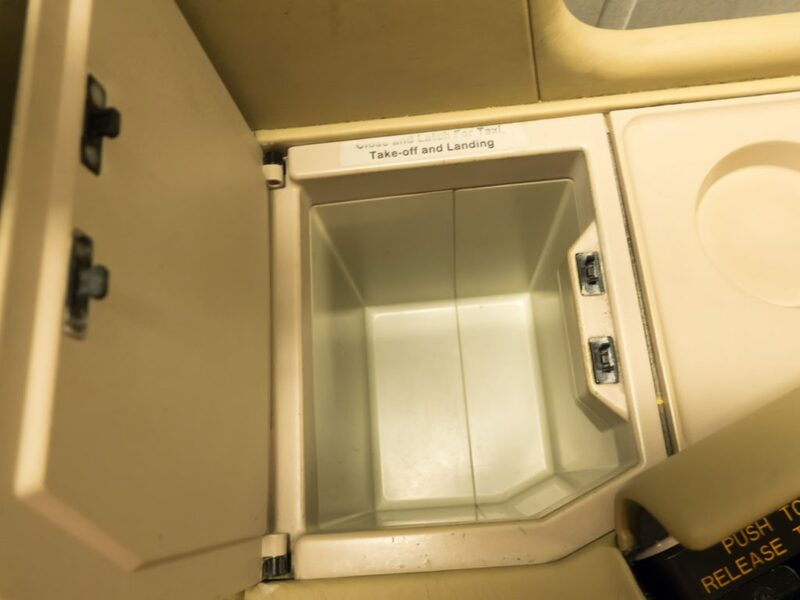 There was a storage area for your small items located to the left of the In-Flight Entertainment (IFE) screen but just note that you’re not allowed to place items there during Taxi, Take Off and Landing (TTOL). 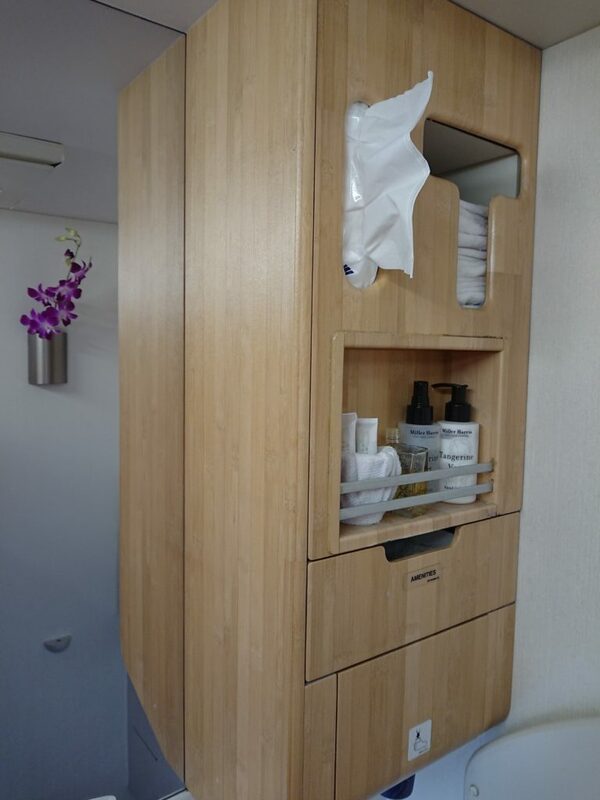 A coat hook was also available but the crew were more than happy (I guess) to store your coat/jackets for you. 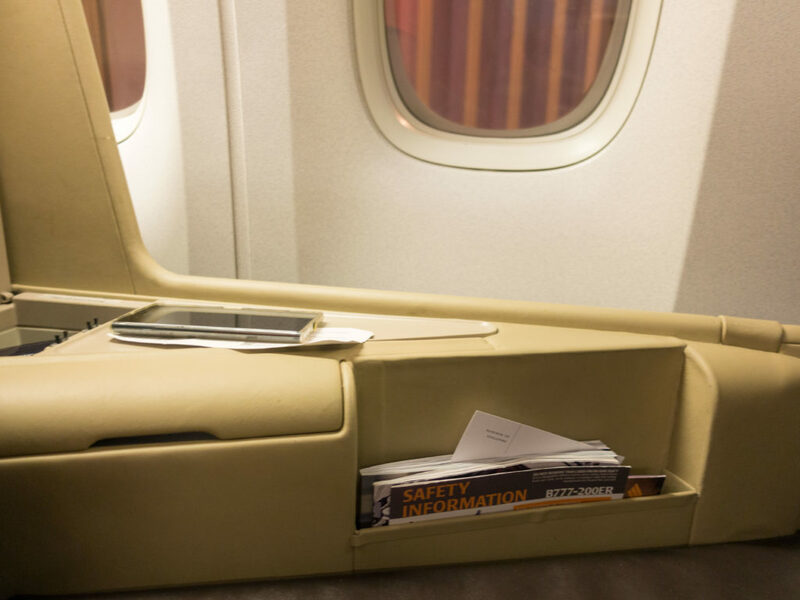 To the left of the seat is where the tray table is located, the literature pocket is also located here together with several compartments to store your personal belongings. The IFE headset was already placed here when I arrived at my seat and is the same model as the one on the flight to Bangkok. The storage compartment was deep and had no issues storing my wallet, hand phone, Sony RX100 camera, passport…you get the idea. 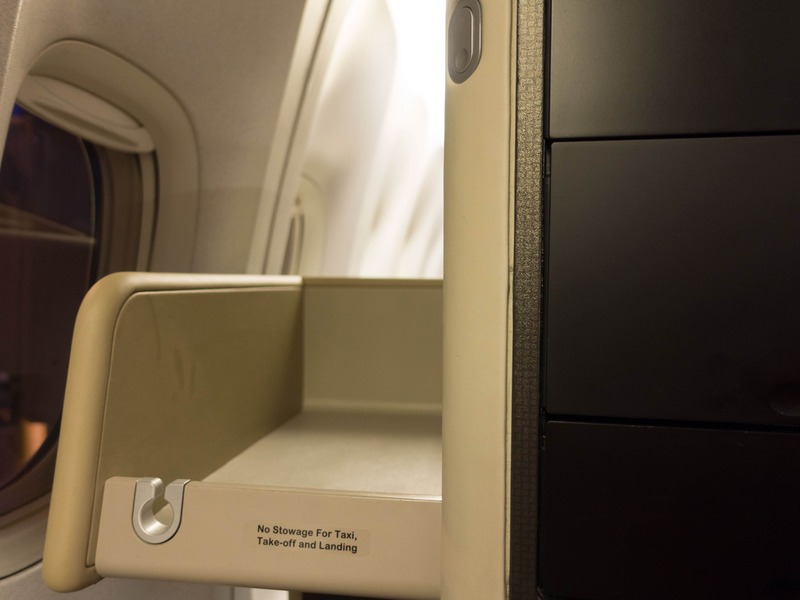 The tray table was also located below the flap above the literature pocket. The much criticized misaligned cubby holes were actually okay for my feet. 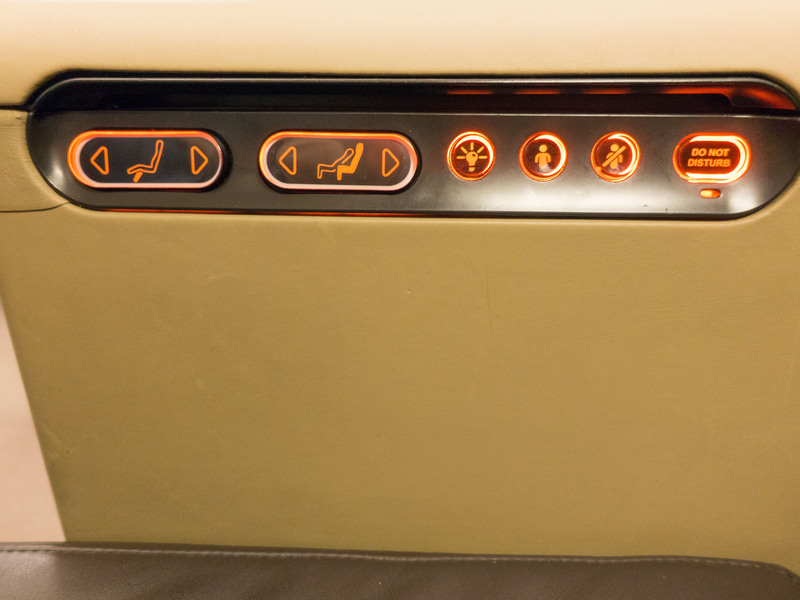 The seat controls for the seat can be found on the arm rest closer to the aisle and I found the buttons a little unresponsive at times probably due to wear and tear. 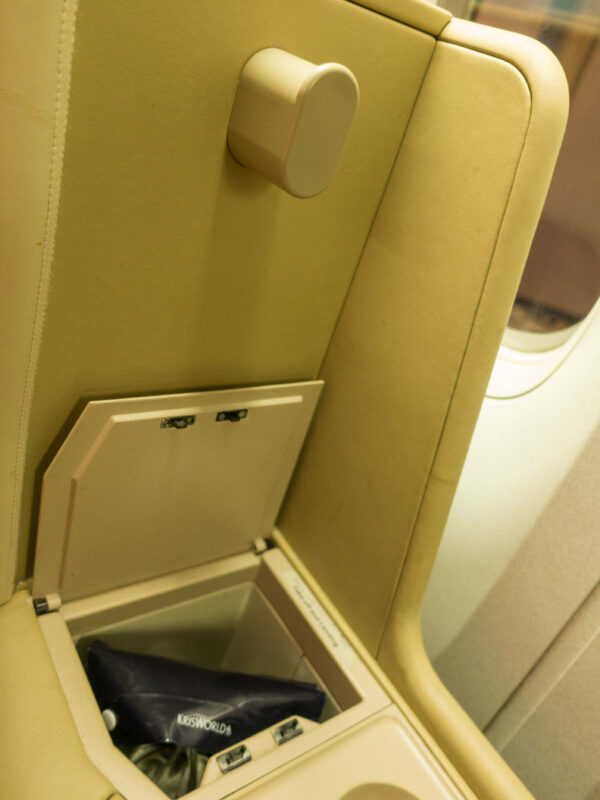 The IFE remote can also be found hiding under a flap just above the seat controls. 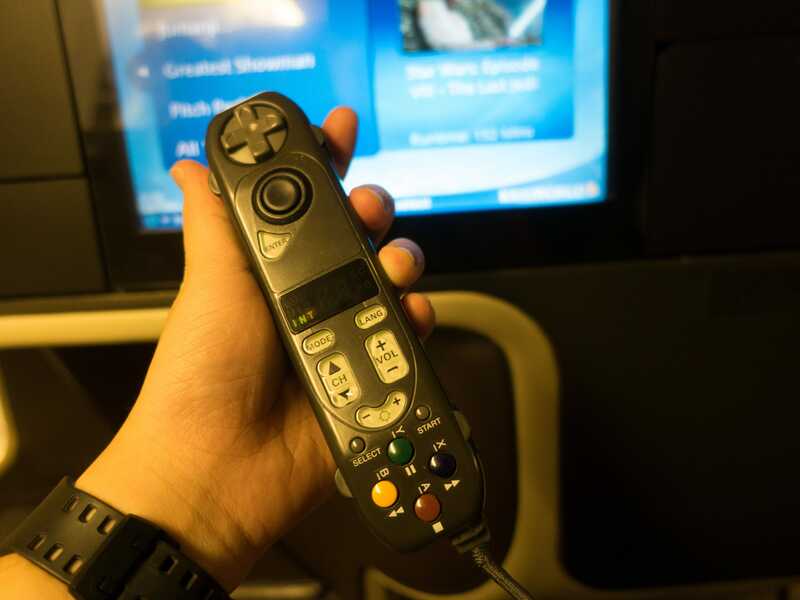 It features an ancient IFE controller but it was still very responsive. 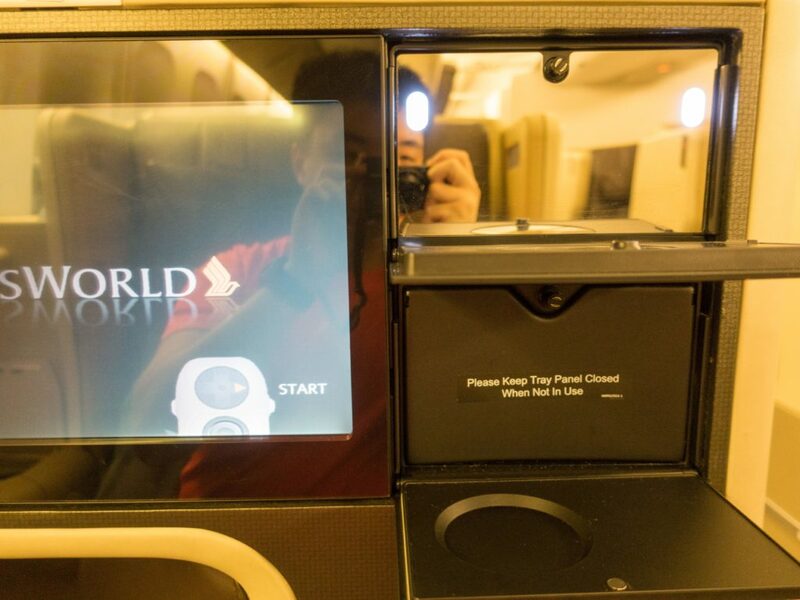 To the left of the IFE screen was an Empower multi-plug power socket and a small receptacle but sadly no USB ports were available. 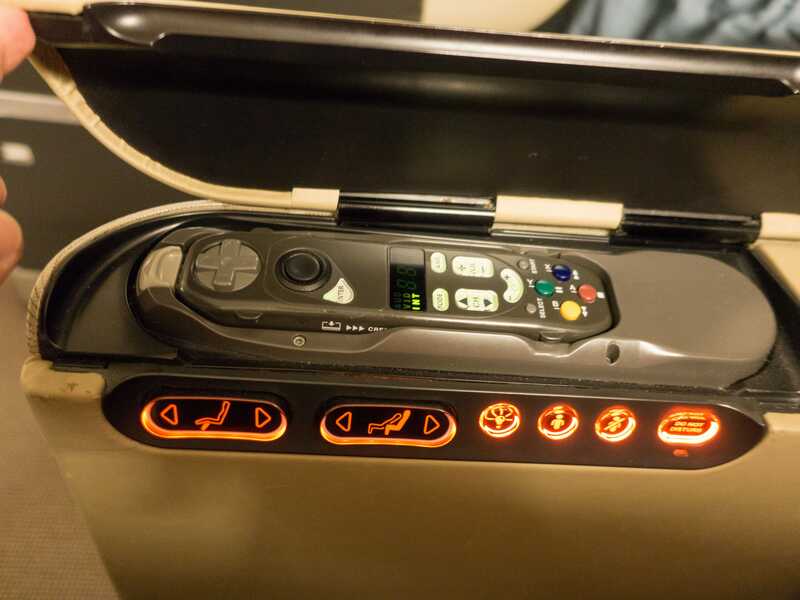 Kinda strange as these seats are identical to those on the Airbus A380s and older Boeing 777-300ERs and those have USB ports. Thankfully I had my power bank on hand to charge my mobile phone. The receptacle could fit my Sony Xperia XZ Premium phone with ease. A vanity mirror was also located on the right of the panel as well as a small cocktail table which felt terribly flimsy. 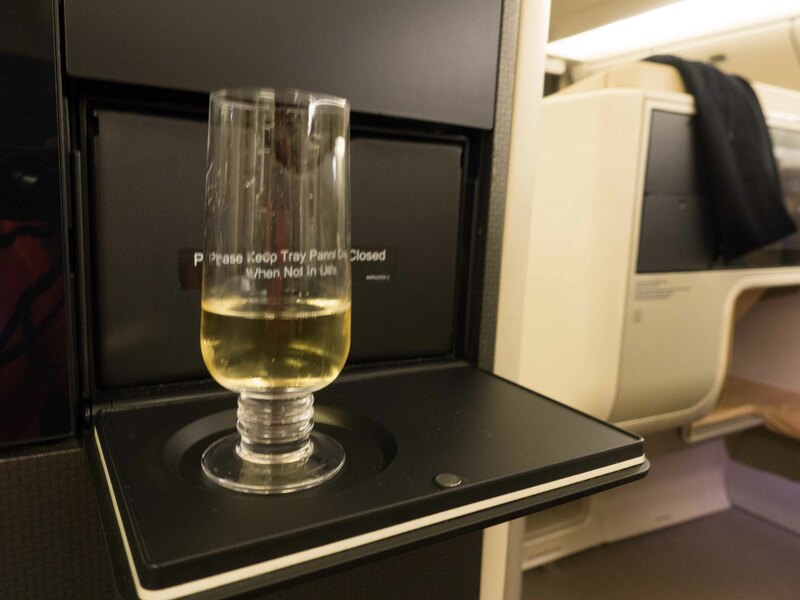 On to the actual events of the flight, one of the cabin crew members came around with a tray of drinks with the option to select either champagne, water or orange juice. Naturally, I selected champagne cause contrary to popular belief, I’m actually of legal drinking age. I didn’t ask to see the bottle but it should still be Charles Heidseck which I preferred over the Tattinger I had in the SilverKris lounge in Singapore. And no, I wasn’t drunk when I took this blurry photo. It’s the camera’s fault. The menu was already in the literature pocket and flights departing from Bangkok do not have the Book The Cook service, so I had to settle for whatever was being catered in-flight. Doors were closed ahead of time and we were pushed back from our gate right on schedule. The take off roll on the Boeing 777-200ER is just awesome as the sound of the two massive engines spooling is just the best. As I wasn’t in the mood for a movie yet, I went to the map mode on the IFE and immediately felt old(er) as the plane continued its climb to cruising altitude. The last time I’ve seen one of these retro flight map displays was way back in 2013 when I was flying Cathay Pacific’s Boeing 747 to Heathrow. 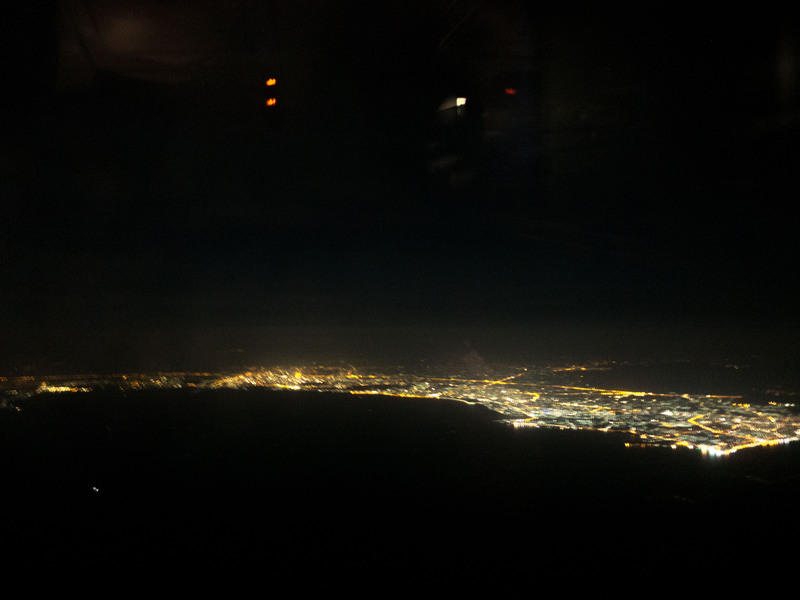 Apologies for the noisy photo as this was taken when the cabin lights were still switched off. 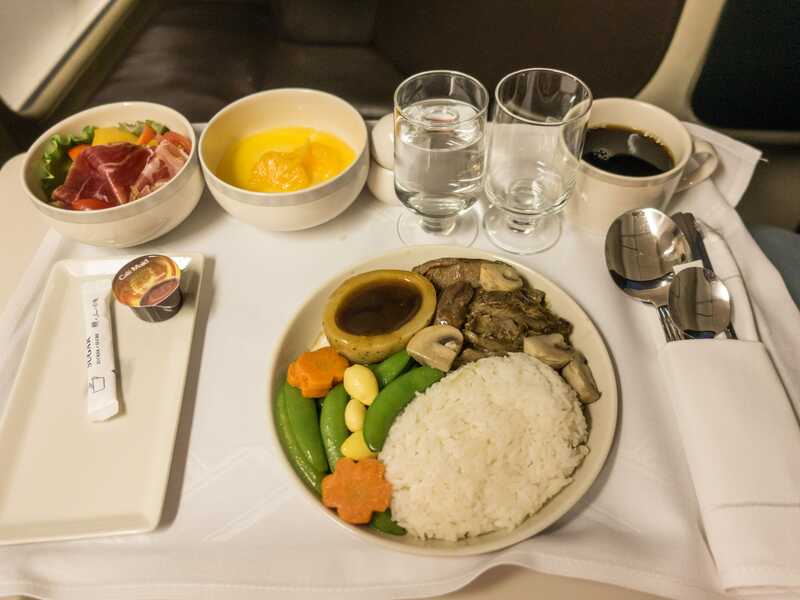 At about 20 minutes into the flight, the dinner service commenced. 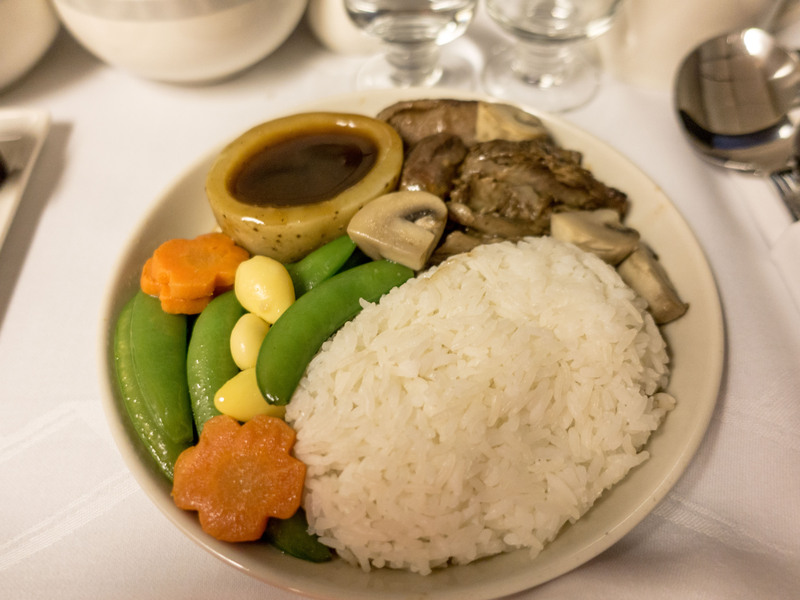 Meals were served from the meal cart and the cabin crew started the service from the front of the cabin. I’d imagine if I was sitting further back I might not have gotten my first meal choice. I went for the Braised Lamb Shank with Mushroom in Spiced Soy Sauce option and the appetizer and dessert was also served on one tray. I accompanied the meal with a cup of coffee. I found it ingenious that they poured the gravy into the potato (yes that’s a potato) so as to prevent the dish from swimming in gravy. The peas were still crunchy and the mushrooms weren’t nuked. The lamb shank was soft and the rice was quite good actually, still maintaining its fluffyness even though it went through the airplane oven treatment. I left the salad untouched as I didn’t really like the smoked ham and the vegetables in it didn’t exactly look appetizing. Halfway through the meal service, the cabin crew came around with a bread basket which I found to be slightly odd as people were already halfway into their main course. After finishing my meal, my tray was promptly collected when one of the cabin crew members saw that my plate was empty. No drink refills were offered which I found to be slightly odd as on my previous flight up to Bangkok, I was asked if I wanted another drink post-meal. Catching hold of the cabin crew shortly after, I requested for a bottle of water and it was promptly brought over. At this point, I made a trip to the lavatories to answer the call of nature. 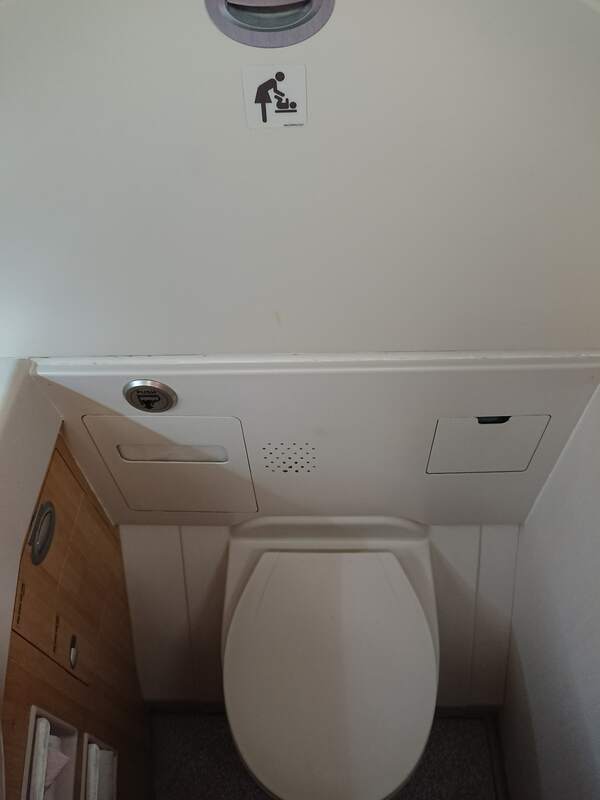 There are two lavatories in the Business Class cabin on the Singapore Airlines Boeing 777-200ER and they’re located at the back of the Business Class cabin. It was maintained well and was spotless when I entered. The toilet bowl was your standard toilet bowl and the flushing mechanism was of the form of a shiny metal button. 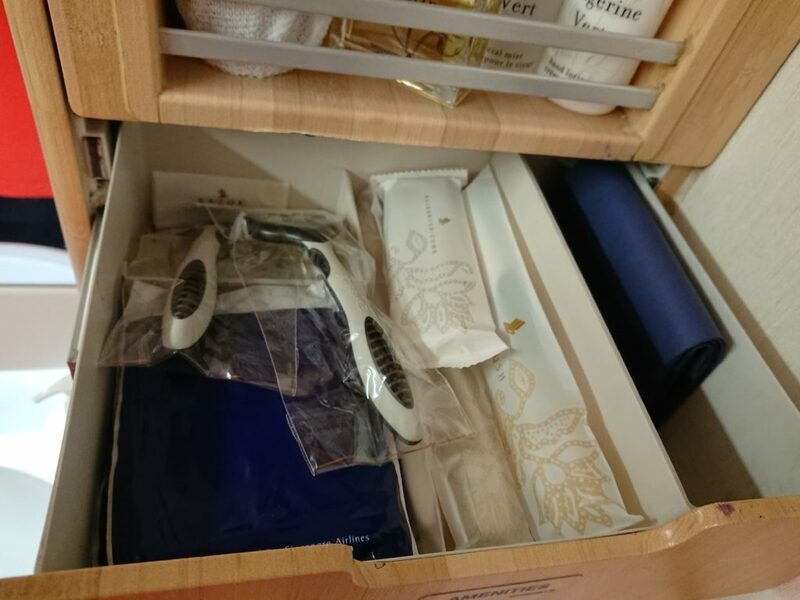 The toilet was well stocked with amenities like toothbrushes, shaving kits as well as handkerchiefs. 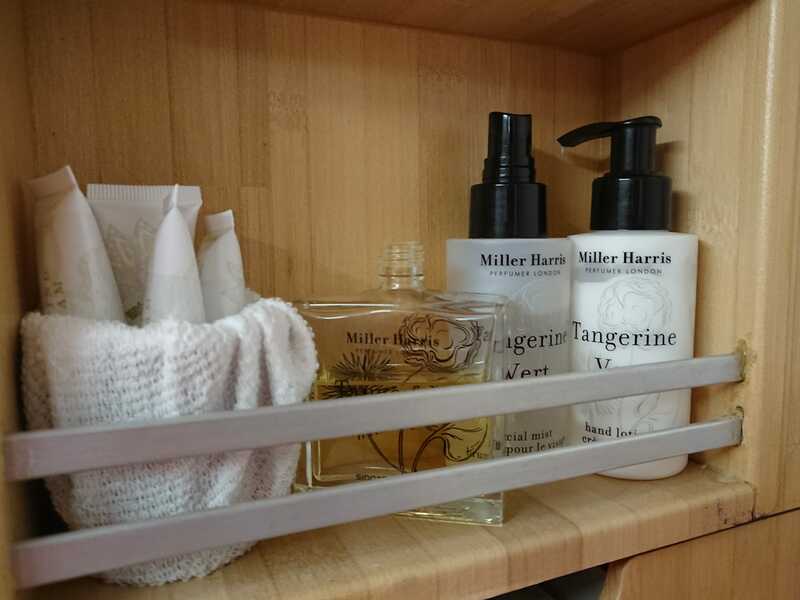 Interestingly, Miller Harris toiletries were still being used on this aircraft while Penhalingon toiletries were available on my 787 flight up to Bangkok. 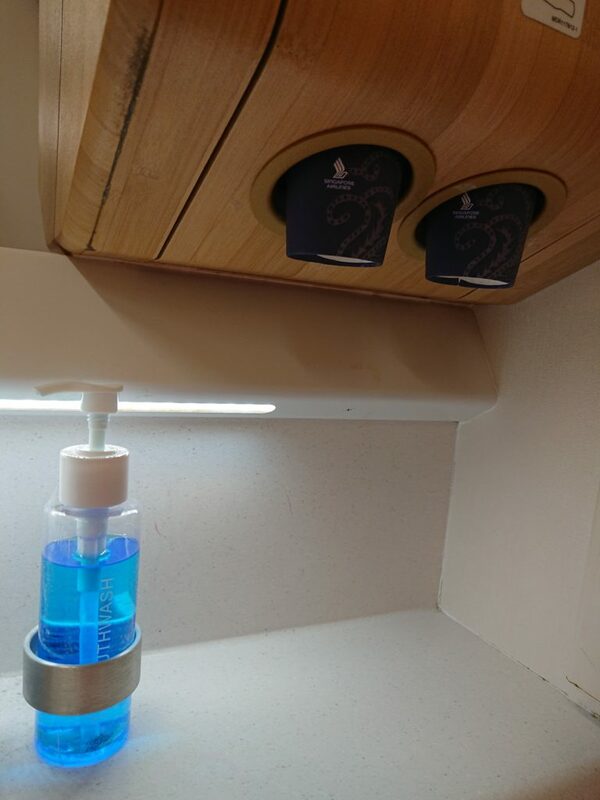 Mouthwash and paper cups were also available. The tap was the traditional kind where you had to push on it to get water. Ah, ye old days without automatic taps. 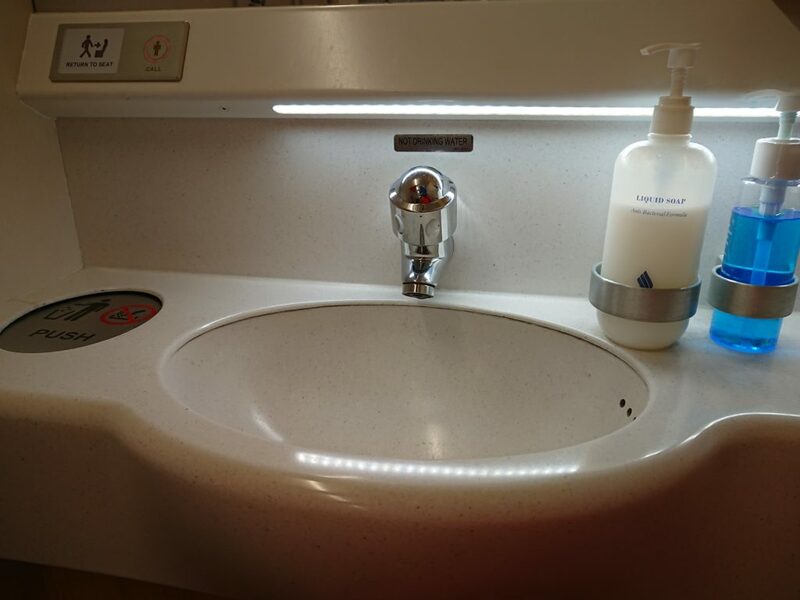 What I can’t understand is how Singapore Airlines uses generic hand soap in its Business Class lavatories while it has branded toiletries on offer at the same time. But that’s just a minor issue and not one you should really go bonkers about. Heading back to my seat after relieving myself, I had an internal debate over whether to trouble the cabin crew to set my bed for me as I only had about an hour left into the flight. 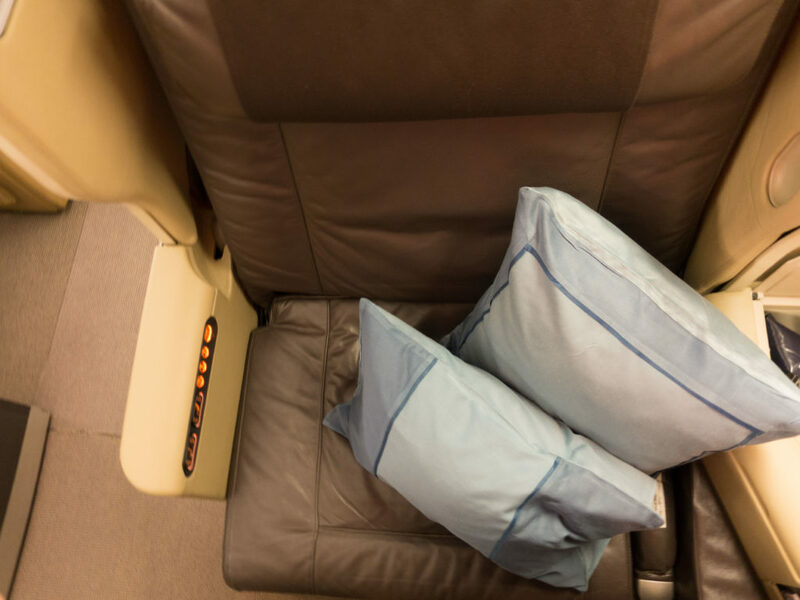 As the chief steward walked by, I sheepishly asked if he could help to turn my seat into a bed and in 5 seconds the magic happened. He patted me on the back and told me to knock myself out. The bed was pre-fitted with a duvet and the blanket was removed from its plastic bag and boy did it look comfortable. I jumped in and quickly got myself comfortable to carry on watching The Greatest Showman. My feet had no issues in the cubby hole and I was able to maneuver around the bed with ease. As the cabin was quite chilly, I snuggled up inside the blanket for the rest of the flight. 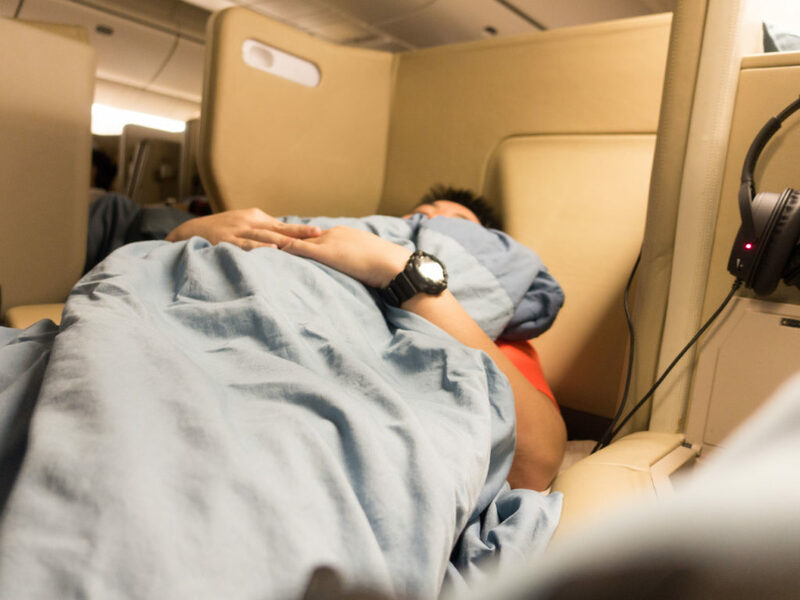 All too soon, the fun was over as the pilot announced that we were commencing our descent into Singapore Changi Airport, so I got up and flipped the bed back up myself with ease. My headset was collected by the cabin crew as I wasn’t using it anymore and the cabin crew prepared the cabin for arrival into Singapore. 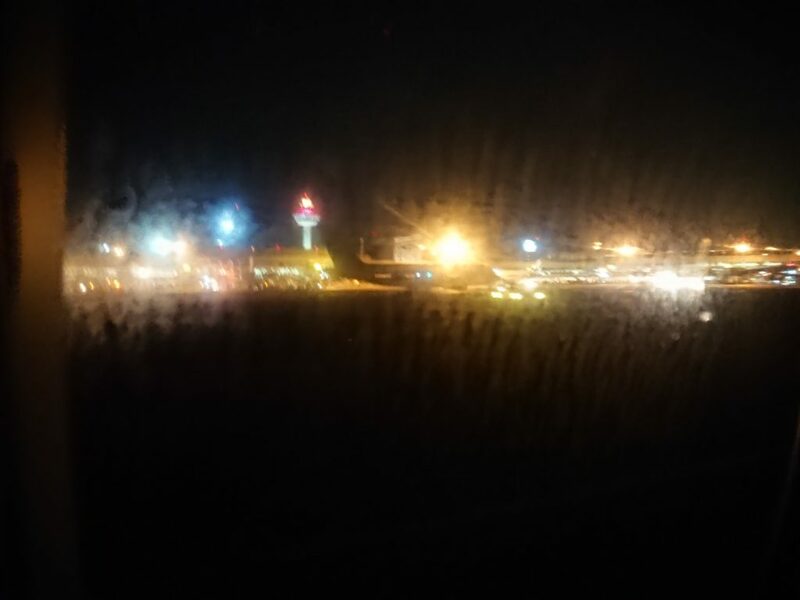 We touched down slightly after midnight and it was a long taxi to Terminal 3 from our runway. And just like that, my 26 Hours In Bangkok came to an end and it was back to the books. Overall, the flight was a good one and I thoroughly enjoyed myself in the 2006 Business Class seats. 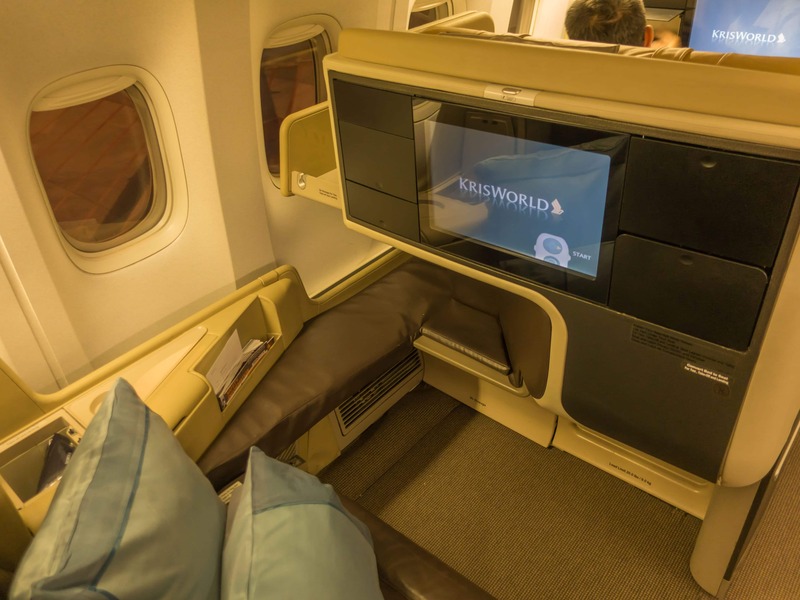 Although I have not tried the 2013 Business Class seats on the newer Boeing 777-300ERs and A350s as well as the 2017 A380 Business Class seats, the 2006 Business Class seat gets the millennial stamp of approval for comfort. My seat wasn’t showing any age and it felt quite new actually. 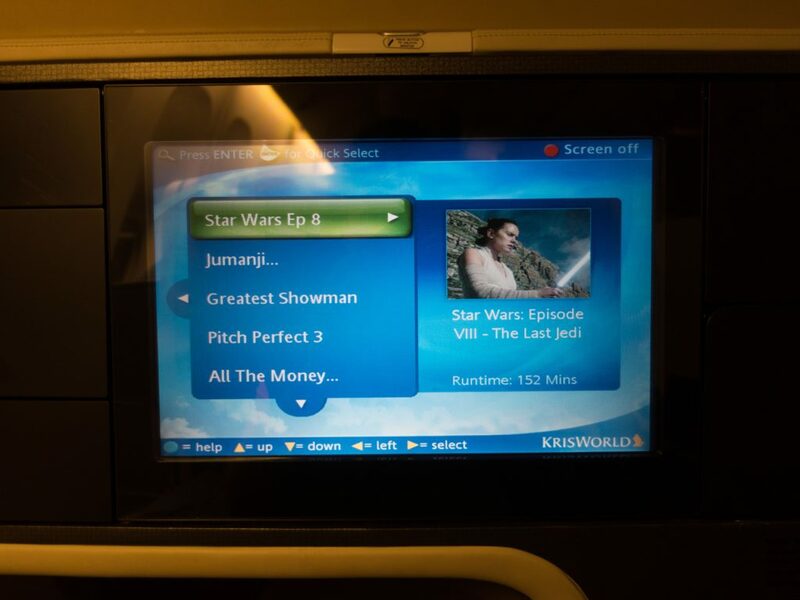 Just a pity that the IFE system was from yesteryear and I’d imagine if you’re flying this aircraft to Istanbul for instance, you might get a little annoyed when you accidentally exit your movie halfway and have to fast forward to the part in which you left off at. 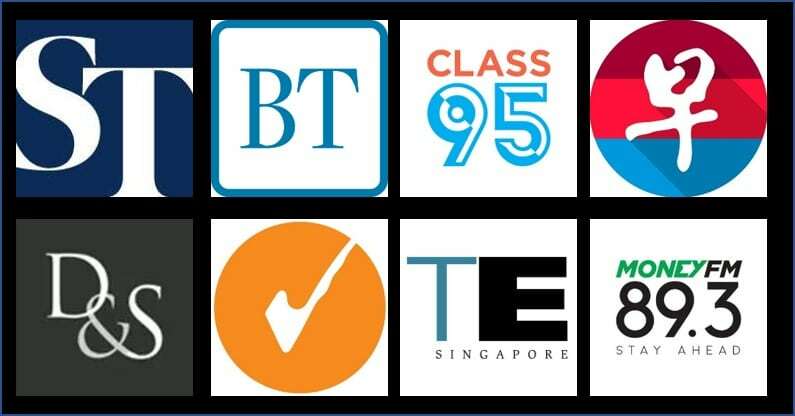 I’m not exactly sure when my next trip report will be but if you have any airline or even lounge products which you would like to be reviewed, do let me know in the comments section below and I’ll take them into consideration! That’s all for the 26 Hours in Bangkok series folks. Signing off, Matt. SQ’s 772 are either powered by RR Trent 892 or 884. 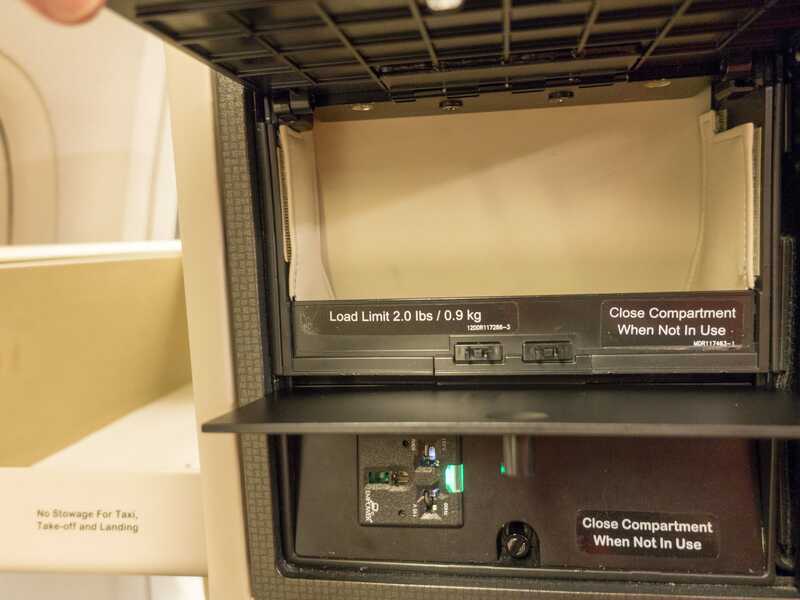 The 90-115B only powers it 77W. For the 772 to have the 90-115B it would make it a 777-200 LR. No worries, AV Geeks learn from each other. 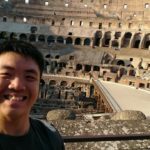 Many thanks for the trip report. I get this flight all the time and find the service very hit and miss. Things you highlighted such as not bringing round the bread until half way through the meal and not offering a drink refil are disappointingly common on this flight for some reason. 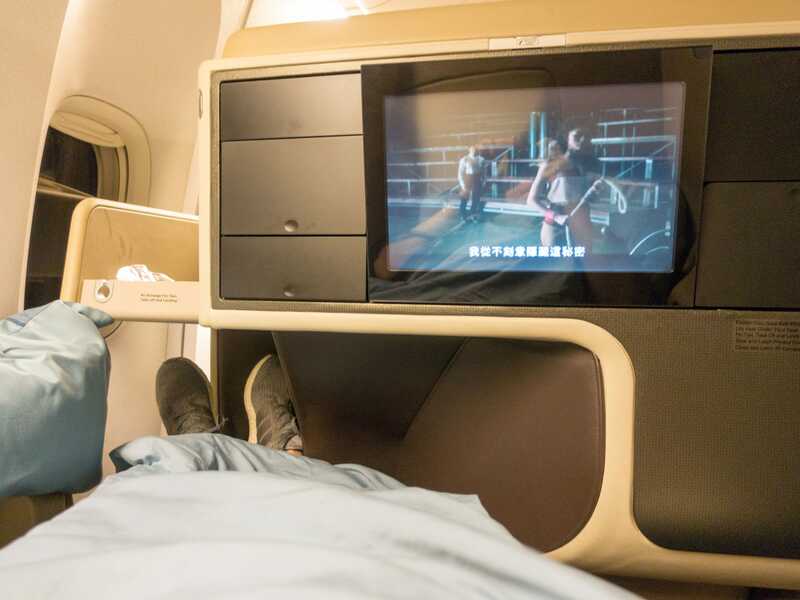 I don’t know if they use this flight to train new crew members but it is certainly a let-down service wise compared to the rest of the SQ Business Class flights. Hey Tom, that’s interesting to hear. 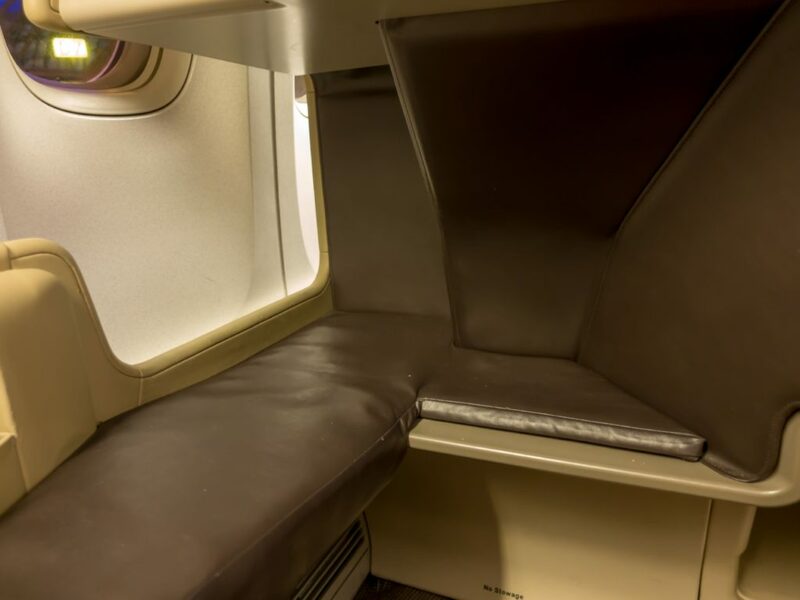 There were plenty of senior crew in the Business Class cabin so I’m not entirely sure if this was meant to be a training flight style kind of thing. If my memory doesn’t fail me there were at least 3 green ties and 1 purple tie steward in the J cabin. Hopefully it gets better on your next flight! To be honest, I long these old big berth seats. The newest one is way too tight in my opinion. Give me this config anytime!